Over 100 million job seekers each month begin their search for jobs straight from the Google search box. Websites ending in .JOBS are an intersection of job seeker behavior & Google search for jobs. It is powerful and proven. What Google does better than anyone is “index” every website on the Internet for inclusion into its search service. By crawling websites, Google is able to dissect the structure and content of each for its ranking purposes. Google indexes over 15 million pages of websites in .JOBS on any given day. By having a .JOBS website your organization automatically gains the advantage of having a “home page” dedicated to engaging candidates. This type of website strategy creates an entire footprint within the Google indexing service aimed specifically at job seeker search queries and attracting candidates. In comparison to being limited to few “career” pages contained within your organization’s .COM or .ORG website, creating a .JOBS website casts a very wide net full of pages of content you want job seekers to find through their search habits when using Google for this purpose. 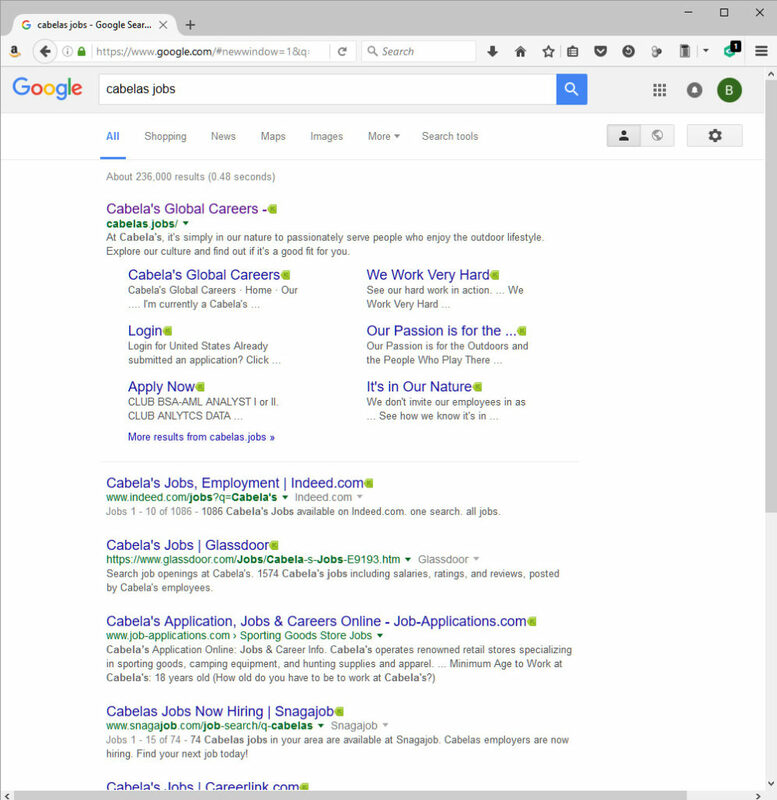 Google is treating Cabelas.jobs as a “standalone” website. Google’s indexing service recognizes a home page along with complimentary pages contained within this website (e.g. “Log-in”, “Apply Now”, “We Work Very Hard”, etc.) – no different than Google does with websites in .COM, .ORG and .EDU for display. Upon building a website in .JOBS for employment, Google recognizes the purpose and responds accordingly, such as this example. Any organization can do this. Job seekers frequently search for jobs at Google by brand name, product name or trade name. 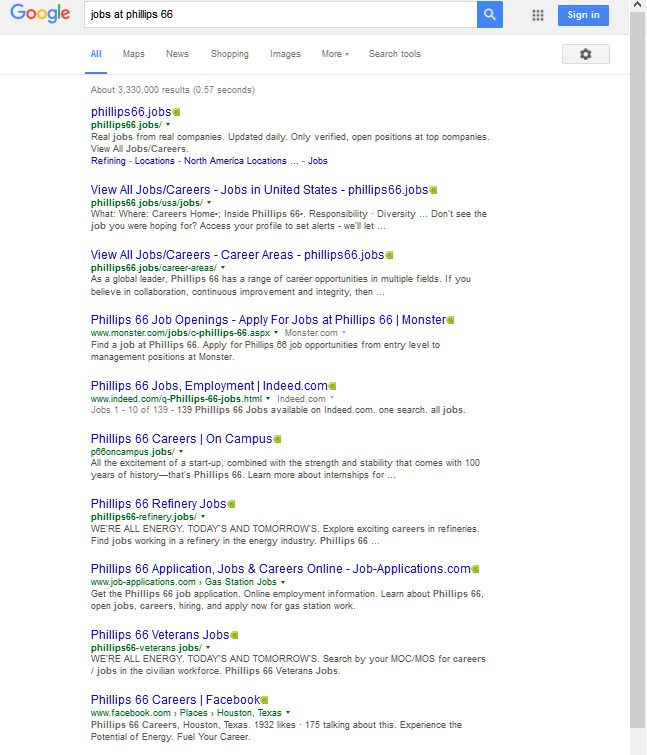 Just look at Google search results when a job seeker searches for: jobs at Phillips66 (or similar). Phillips66 wins the top 3 organic search results with Google and through the strategy of building multiple targeted websites in .JOBS wins 7 of the first 10 results on page 1. Results are hundreds of thousands of job seekers visiting Phillips66.jobs through free search engines led by Google. Phillips66 successfully leverages .JOBS websites with Google to manage the candidate experience from start to finish. What Google can’t do is index a .JOBS website that does not exist. If you do not have a .JOBS website, then it is not possible for Google to index and be part of this particular eco-system for job seekers to use. Naturally Google is a big driver to the over 300 million job seekers engaging with .JOBS websites each year from nearly every country in the world. If you have a .JOBS website then Google is already indexing it for you. Anyone can search Google to find it. This is how you use .JOBS with Google.